An artist's depiction of the Gateway, a proposed lunar space station, under construction. NASA is asking for help making shipments to a future lunar space station 240,000 miles (almost 400,000 kilometers) away. The agency opened a solicitation this week asking companies to consider what they'd need to deliver cargo; United States firms have until Nov. 2 to provide their input. 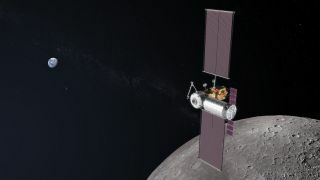 The agency is designing its Lunar Orbital Platform-Gateway, a space station that is expected to orbit the moon and host astronauts beginning sometime in the mid-2020s. But the design work is starting now, to make sure the agency is ready and commercial partners are available. NASA isn't ready to actually hire a contractor yet, as the agency is just looking for more information about who might be interested and what factors would influence its willingness and pricing, hence the short turnaround for this request. The Gateway will still be under construction during the first two cargo missions, which means NASA is looking for a module that could pull double-duty: Once each module is docked to the station, it would serve as a handy storage space and eventually as a trash receptacle. NASA is also looking for cargo vessels that could launch both on commercial rockets, for the first two deliveries, and on its own huge moon rocket under construction, the Space Launch System — which will be tested in 2020 with a round-the-moon trip. "As the agency moves humans deeper into the solar system with its partners, a spaceship in lunar orbit is necessary to achieve the ambitious exploration goals set forth by President Donald Trump and to prepare humanity for missions to the moon and Mars," NASA added in the same statement.